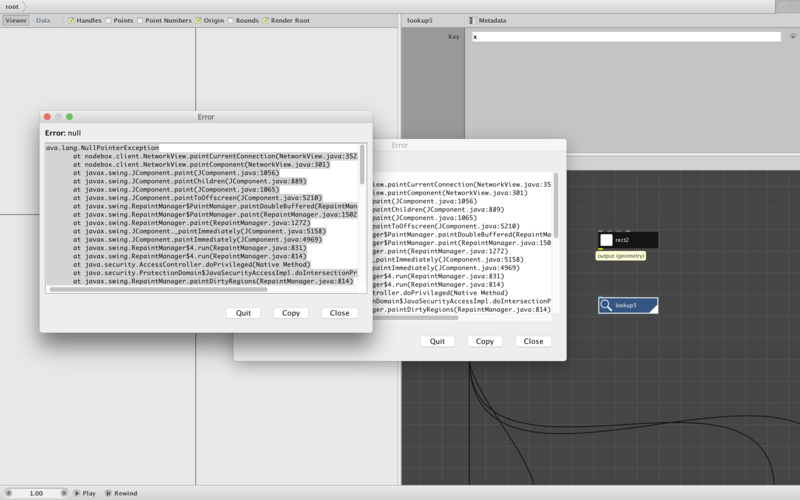 I've been having this recurring problem with NodeBox for the last few months (so maybe since 3.48). I'm not sure exactly what triggers it, but it happens with all different kind of networks. It just happened again so I am attaching a screenshot. The problem occurs when I double-click in the network area to add a new node and try to attach its output to the input of some other node. The newly added node is rendered by default. Just as I start to stretch the link two identical error dialogs pop up, one on top of the other. Looks like they are NullPointerException errors. When I dismiss both dialogs they reappear whenever I move the cursor within the network drawing area. Normally my cursor is already within that area, so dismissing the dialogs causes an endless loop of more dialogs. Good luck tracking this one down. You might start by finding out why there are two dialogs. I notice that duplicate dialogs now happens even for ordinary errors. Thanks for the bug report, I'll look into it. However, the error dialog obscures the number the error occurs. It should be 350 or 351 in the first line, could you check? Sorry, but I closed NodeBox without saving the error message, so have no way of checking. And I can't seem to make it recur. That was stupid of me. Next time this happens I'll be sure to save the error text. The error just happened again. It happened just as I was trying to connect the output of a concatenate node to another node (a subnetwork). In fact the yellow "output (string)" hover text is still frozen on the screen. If I move the cursor anywhere within the network composition pane I immediately get two identical error messages, one exactly on top of the other. So it looks like it happened at line 352. It's a rare bug; I still have no idea what triggers it. As soon as I quit and restart, everything will be fine. Hope this helps you track it down! Thanks for the stack trace. Is this with NodeBox 3.0.5.0? It happened after I had been coding in NodeBox fairly intently for around an hour or so, so there might be a memory leak involved. 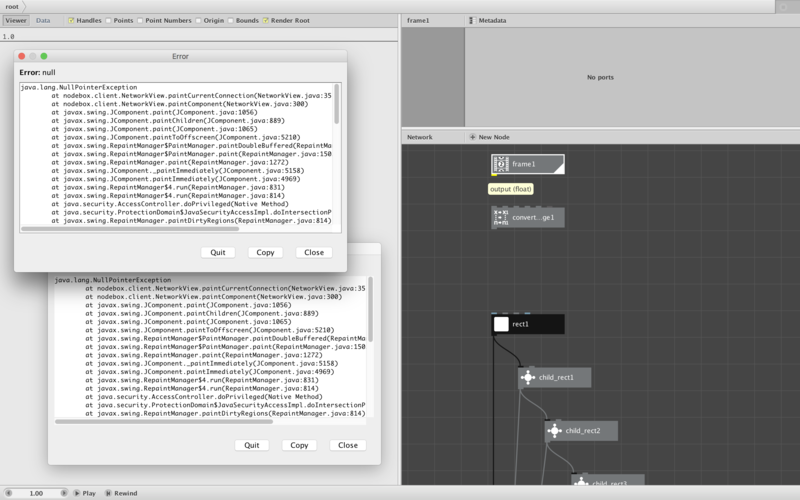 Just before attempting to make the link I had copied and re-positioned the node. I think I may have done the same with earlier instances. Weird, it doesn't look like a memory leak error. But the stack trace helps, so I'll try figuring it out. It just happened again. Appending one of the multiple error traces. Looks identical to the last one. This time it happened seconds after launching NodeBox and opening a network, so that would seem to eliminate the memory leak theory. I moved a node around, created a new rect node, created a lookup node below it, and was about to hook the rect to the lookup. The output port of the rect node is still yellow and the hover text is visible (see attached screenshot). Just to let you know, this bug still happens to me regularly. (about once a week). Each time I am trying to draw a link from one node's output to another's input and let up on the mouse while the tool tip is displayed (see any of the above screenshots). I always get a pair of identical error messages, one on top of the other. I have to drag them away from the network pane in order to dismiss them, and every time my mouse moves back into the network pane I get another pair of messages. The only remedy is to quit and restart.